Once upon a time, there was an author named K. A. Applegate. And – back in the 90s – almost every boy and girl had read her middle-grade series Animorphs. It was an awesome, sci-fi series about teens who are given superpowers and forced to save the world. This series taught me about loyalty, bravery, how to make tough (and sometimes immoral) decisions – all while seeing diving through the ocean as a dolphin, soaring across the skies as a hawk, or snuggling up to your favourite person as a dog. Its 55+ books still occupy a shrine-like space on my shelves, and you can guarantee that I will be giving the books any child of mine. Oh, and there was a TV show which starred that hot guy who has a twin… anyhow. If you have no idea what I am talking about, you may soon, as Scholastic is reissuing the Animorphs books in May 2011. I am not too crazy on the new covers, but think it is awesome that I even have new covers to complain about. 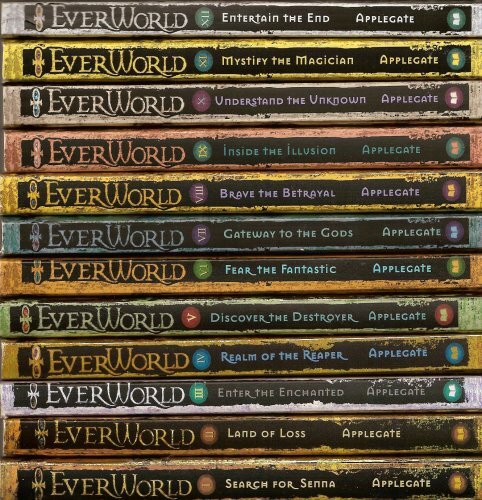 So, after Animorphs, Applegate wrote a Paranormal Young Adult series called Everworld. It was the one and only YA series I read as a young adult, and it was fantastic – 12 books which followed 4 teens stuck in a crazy universe which took Old World Mythology and stuck it in a blender. I wish I could explain how much I loved this series: it was very dark, quite bloody, occasionally romantic, and had a dash of humour in some rather unexpected places. In the dark past, Zeus and Odin, Huitzilopoctli and Ra, and the other gods of myth decided to abandon the real world. They created another universe, where magic rules, where all the mystery and terror of these capricious immortals holds sway. It is a place where Vikings still sail in the name of Thor, where the Aztecs still make human sacrifices to Huitzilopoctli, and where Merlin still weaves his subtle webs. For a thousand years and more, Everworld has existed apart from the real world. But now Everworld is in trouble. The cozy universe created by Earth’s ancient immortals has been invaded by the creatures of myths that are no part of human tradition. The gods are under attack, divided and terrified. And in this moment of supreme danger, Loki, Norse god of evil, reaches across the barrier between Everworld and the real world to seize a new power: Senna Wales. Senna carries with her four ordinary high school kids from the Midwest: David, the insecure hero and Senna’s love; Christopher, the joker Senna spurned, who hides his own anger and bigotry beneath a glib veneer; Jalil, cold, calculating, and so devoted to rationality he can’t even acknowledge his own strange tie to Senna; and April, Senna’s half sister — actress, flirt, and Senna’s most dangerous enemy. The series is currently out of print (I know, right?? ), but you can get new copies of the books very very easily on Amazon Marketplace (US site). But you know what would be awesome, oh Scholastic dearest… a bind-up! A lovely, shiny, beautiful bind-up of the Everworld books. Consider that small plea from a girl who would consistently drag 50+ Scholastic books to the counter (á-la-Matilda) for her mother to buy. You know, I’ve seen those books around but never really bothered to look at them or what they were about. They actually seem like they could be quite interesting. Quick reads, certainly, by the looks of the size of them, but sometimes there’s nothing wrong with sitting down with a small pile of quick reads in a series and just having fun. I might have to see if my library has any of those books in, now. I will have to take a look at these books. My niece is 14 years and I am always looking for books to grab her attention.